I grew up a lake sailor in Enfield, NH at the Dartmouth Sailing Club. I always considered being on the lake a point of pride. Growing up I was super fortunate to have incredible coaching from Dartmouth Sailing Team members. I was and still am a dinghy sailor in the Laser and Laser radial classes. Years ago I went to the 2008-2009 Volvo Ocean Race stop in Boston and ever since then I have been in awe over racing around the world. And I dreamed of owning a large boat to sail on the ocean with. In 2015 my wife and I purchased a 36′ sailboat and with that I really became addicted to ocean sailing. Every winter I love to “couch sail” following all the big distance races. There is one big difference for me that I never shouted about, I have Cystic Fibrosis. 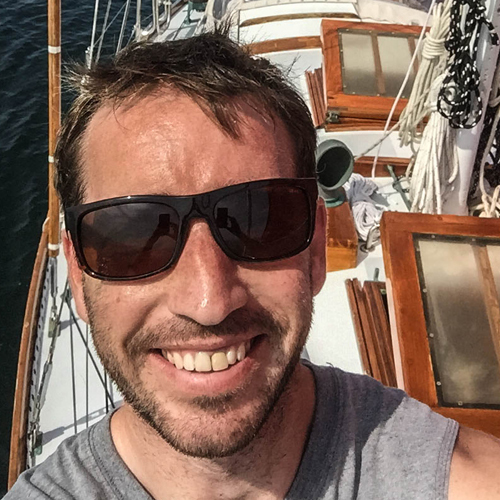 In November of 2015, I lost my identical twin brother and life sailing companion, Michael. The pain is still indescribable some days but I have decided to channel this energy and pursue my life dream of sailing the world’s biggest oceans. Michael would surely be so proud and I want to keep his memory alive through my sailing efforts. He has a amazing story to tell and I want to share it. Many of our greatest moments almost all revolve around boats! My goal now and my reason for pushing to sail at Oakcliff is that I want to become the first sailor in the world with Cystic Fibrosis to circumnavigate the globe.